3964 ⊙ 2Ya,2Xa 2 Kr. Black, machine paper, two examples and 2 Kr. Black handmade paper, fresh colors and neat cancelled, photo attests Dr. Ferchenbauer. Michel 250,- €. 3965 ⊙ 3X 3 Kr. With clear bar cancel \"AUSSEE Moravia 1.11. \", with wide margins, superb in every respect (choice copy), expertized Dr. Ferchenbauer (Müller no. 114 a). 3966 ✉ 4Ya,5Ya 6 Kr. Brown, type III, two examples, of it of a reverse, as usual at the letter opening separated, with 9 Kr. Blue, type IIIb, all values fresh colors and good to wide margins on attractive cover with single circle postmark \"K. K. ÖST. 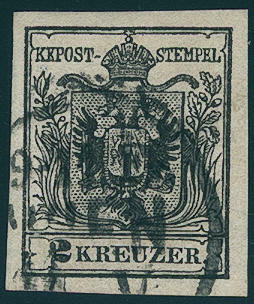 F. P. KRAJOVA 20 / 12 (1855) \" with on the 6 Kr. Turning into single line cancel \"RECOM\" with blue senders mark top left over old Orsova with disinfection stamp from 22.12.1855 and transit single circle postmark \"TEMESVAR 24.12. 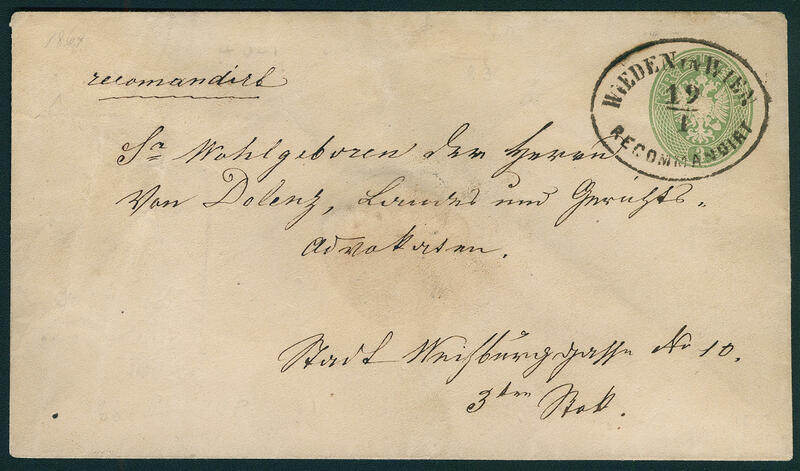 \" to Pesth with arrival postmark. A spectacular cover from the from Austria occupied Walachia during of the Crimean War. Registered hereof to class among the large rarities. 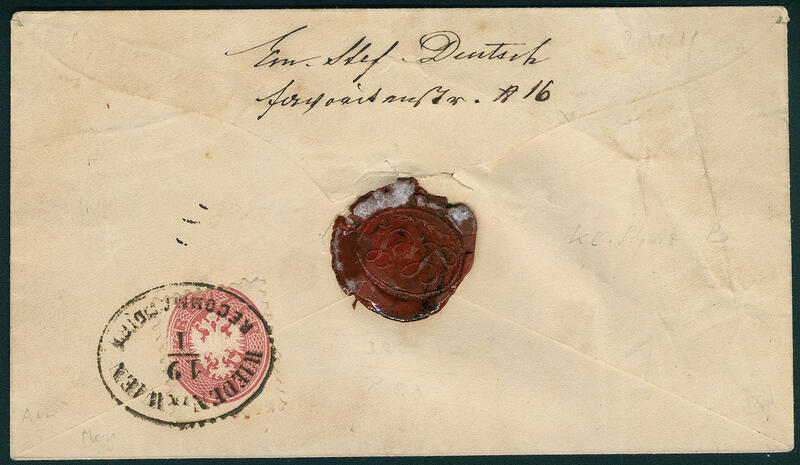 It is only another defect cover to Prussia and one to Karlsburg known. A top piece the classic Austria philately! Photo expertize Eichele. 3967 ✉ 5YaIII 9 Kr. Blue, machine paper, type III, fresh colors and on all sides having full to wide margins (right above broken margin line) on decorative cholora letter with single line cancel \"C. V. There TRIESTE\" and smoked slits, as well the rarely ambulance cancel \"FERRARA NETTA FUORI E DENTRO\" to Lugo with transit and arrival postmarks, inside dated \"TRIEST 11. NOVEMBER. 54\". 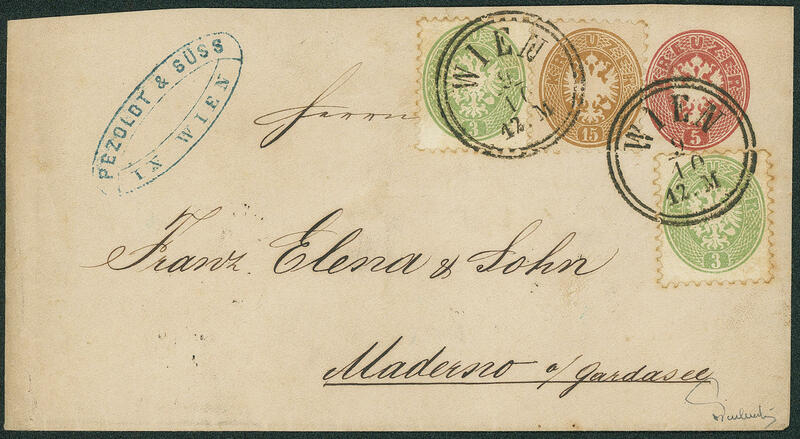 A very attractive cholora letter of the first issue from Austria! Certificate Matl. 3968 ✉ 5YaIIIb 9 Kr. 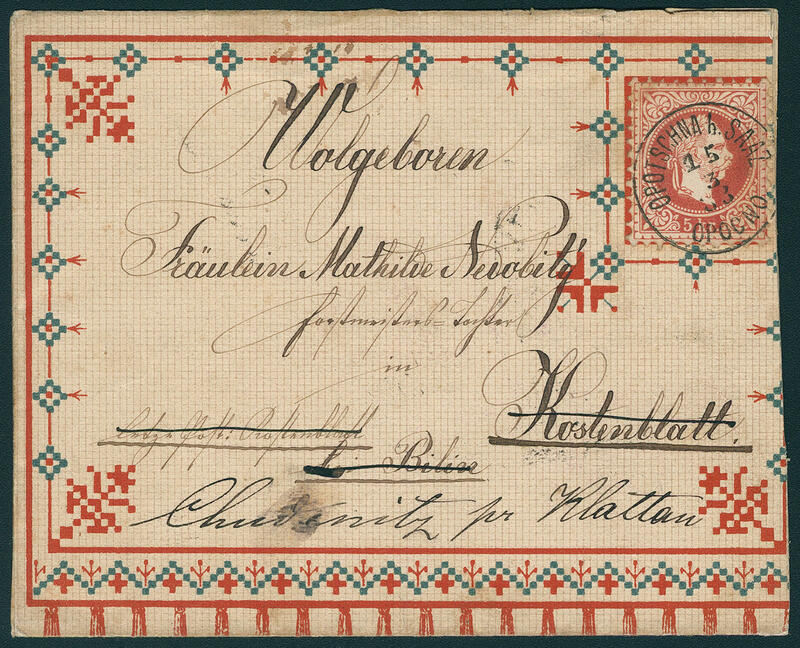 Blue, machine paper, type IIIb, on all sides good margins on small-format cover from \"Vienna 27.11. \" over Triest mailed to Kolkata / India with transit cancellation \"TRIEST 29 / 11\" and transit cancellation of the British post office from Alexandria, as well the complete arrival postmark \"CALCUTTA STEAM letter\". For a such destination as usual patina. 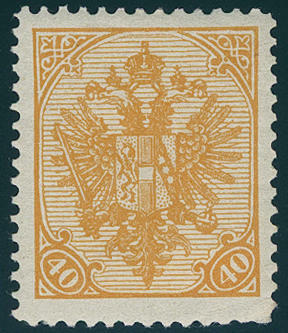 Foreign country postage of the first issue from Austria are general rare. To India is a the most important destinations rarities of this area! Photo expertize \"very fine example\" Dr. Ulrich Ferchenbauer / VÖB. 3969 ✉ 11IIc,13IIb 3 Kr. Deep black, type II, as well reverse 5 Kr. 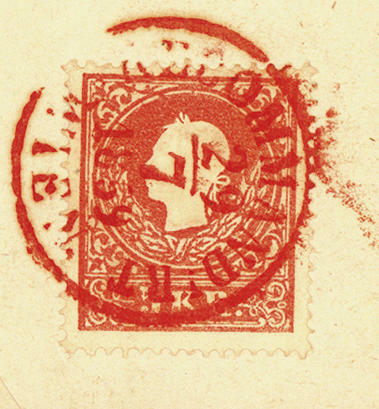 Red, type II, both values wonderful fresh colors and very well perforated with clear red single circle postmark \"Vienna registered 29.7.1859\" as rare locate registered. A likewise rare like nice cover for the highest standards! Photo expertize Dr. Ferchenbauer. 3970 ⊙ 12a 3 Kr. 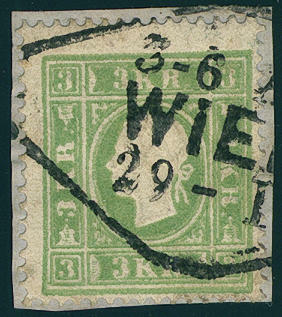 Green with illuminating red stamp \"Vienna\", small faults, photo expertize Dr. Ferchenbauer. Michel 300,- €. 3971 ∆ 12a 3 Kr. 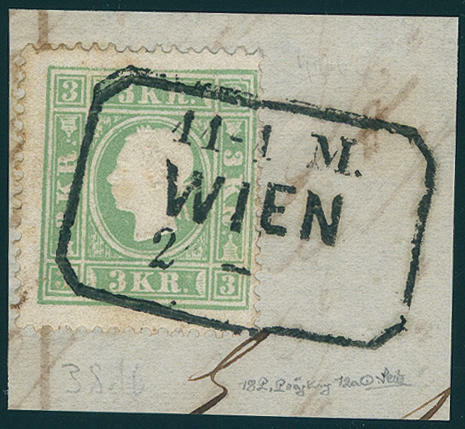 Green on superb in every respect piece of letter with clear rectangle cancel \"Vienna\", signed Seitz. Michel 180,- €. 3972 ∆ 12a 3 Kr. Yellow green, fresh colors and in perfect condition on piece with clear rhombus cancel from \"Vienna\", photo expertize Dr. Ferchenbauer. Michel 180,- €. 3973 17a 1, 05 Kr. Dark lilac, newspaper stamp, wide to enormous margins, at the bottom very close margin, of the looping address for the examination disengaged, with part gum, attest Zenker. Michel 300,- €. 3974 17a(7) 1, 05 Kr. 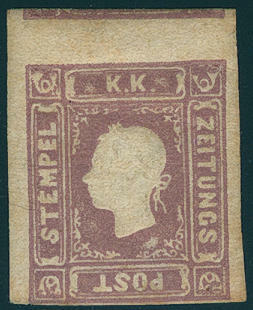 Dark lilac, type II, newspaper stamp from 1858 in the sensational unused second molar souvenir sheet with parts the original gumming, two stamps thin, gum free places and a tear only in the margin of sheet are practically insignificant. The unit presented be large margins all around and comes from of the right lower corner of the sheet. It is the largest known unused unit of this issue. Also in the special catalogue from Dr. Ferchenbauer was a so large unit still by appear of the catalogue unknown. A major rarity the classic Austria philately and in this kind a Honor for the advanced collection! Expertized Matl BPP, photo expertize Dr. Ferchenbauer. 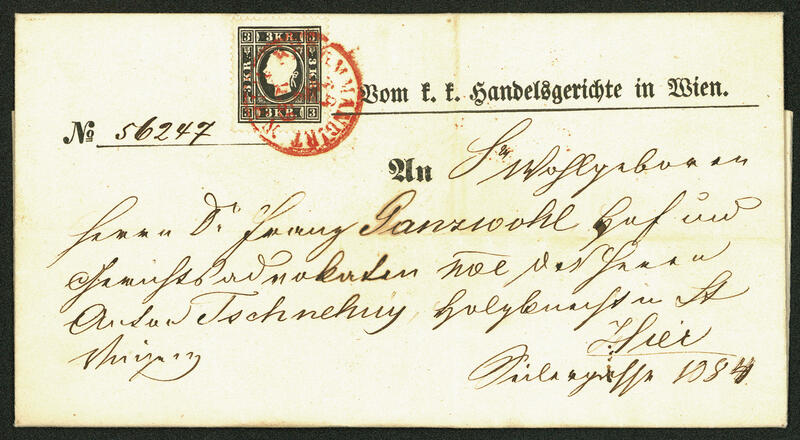 3975 ✉ 19a,26a,27b 3 Kreuzer light green issue 1861 in the horizontal pair, as well 5 Kreuzer rose and 10 Kreuzer blue issue 1863 as very nice, correctly franked three colors mixed franking over 21 Kreuzer on cover from \"TRIEST 15.1. 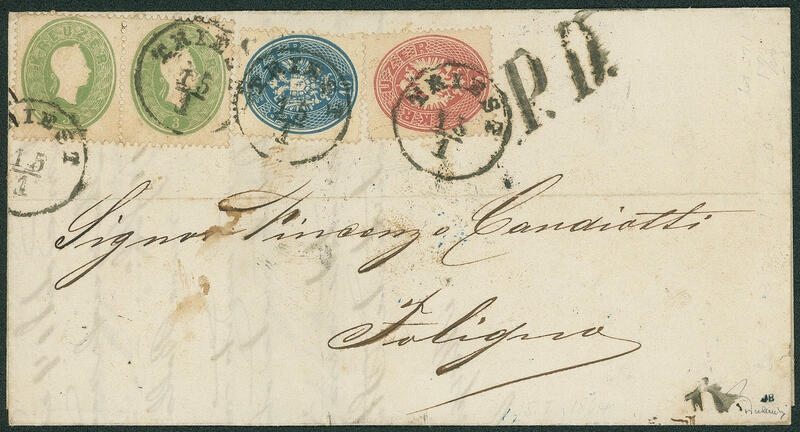 (1864) \" to Foligno / Italy with arrival postmark. All values are fresh colors and in perfect condition. 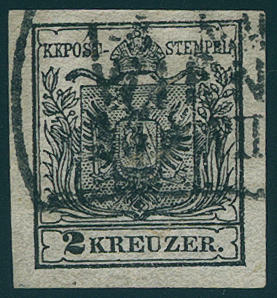 The 21 Kreuzer postage counted in accordance with Italian / Austrian postal agreement from 1854 for a cover from the third Austrian in the second Sardinian section. A wonderful cover this extraordinarily rarely franking! Photo expertize Prof. Dr. Ferchenbauer. 3976 19Ax 40 H. Orange yellow, ordinary paper, in perfect condition unused. Michel 230,- €. 3977 ✉ 20,26 5 Kr. Pale red, Kaiser Franz Joseph I. And 5 Kr. Carmine rose, double eagle 1863, two having bright colors and good perforated items in outstanding quality as extremely rare mixed franking same denomination value and colours on small-format cover with single circle postmark \"RIVA 10 / 11. 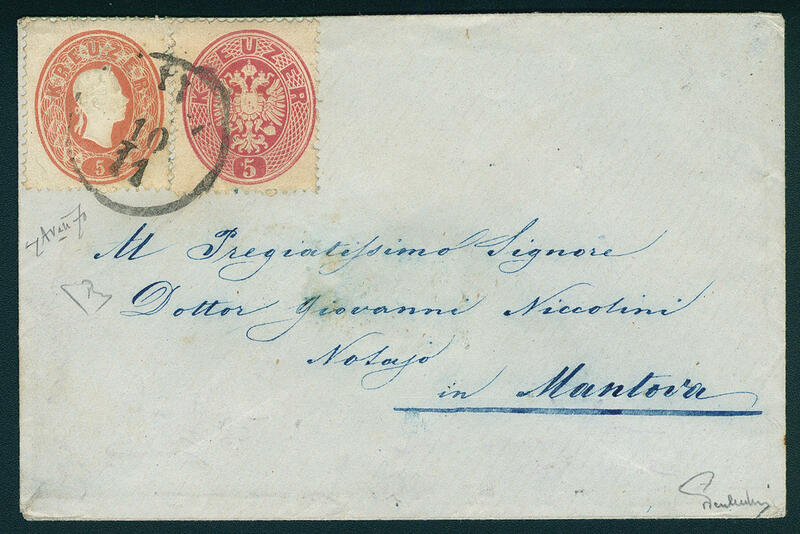 \" to Mantova with arrival postmark. A very decorative cover this franking rarity! Photo certificates Enzo Diena, Dr. Ferchenbauer VÖB. 3978 ✉ 20/22 5 Kr. Red, 10 Kr. Brown three times and 15 Kr. 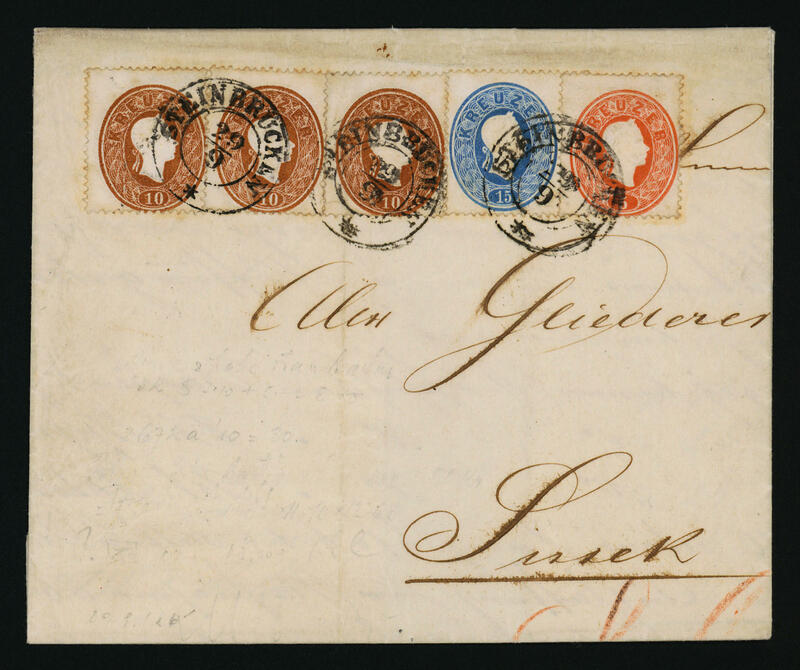 Blue as particularly beautiful and decorative three colours franking on mint cover with two ring cancel \"Stone bridges 29 / 9 (1861) \" to Sissek. An exceptional nice and scarce representation of the 50 Kr. Postage. 3979 / 29Ya 1, 05 Kr. Gray brown, newspaper stamp 1863, horizontal strip of five watermarked, wonderful fresh colors and with wide margins, The Persuaders! 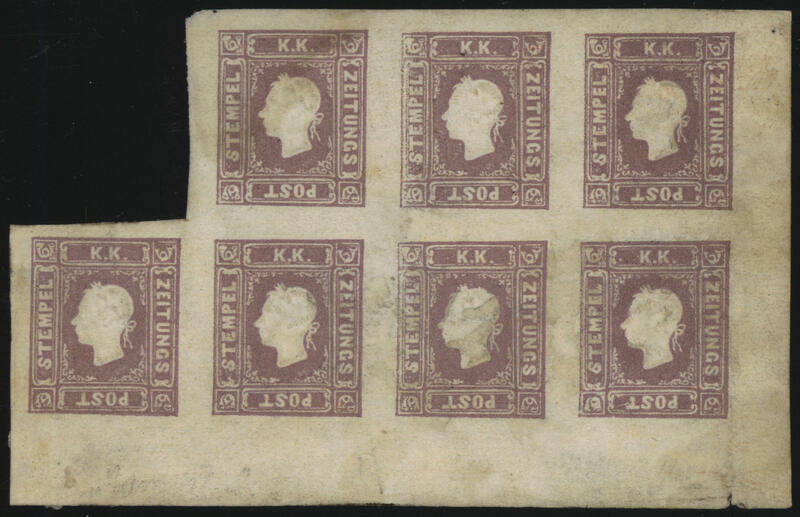 Exterior stamps with tenuous traces of a hinge, otherwise in perfect condition mint never hinged a particularly beautiful and scarce unit in outstanding quality! Expertized Dr. Ferchenbauer. 3980 ✉ 31a,34a,U18B 3 Kreuzer light green twice and 15 Kreuzer brown as very nice and scarce additional franking on postal stationery cover 5 Kreuzer dark crimson pink (size 147:84 mm), tips of the teeth partly minimal yellowish, with especially clearly two ring cancel \"Vienna 9.10. 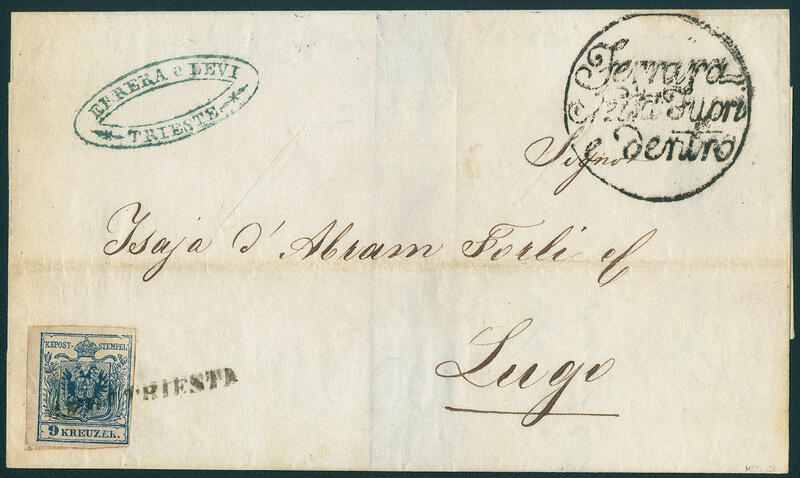 (1865) \" to Maderno / Italy with transit and arrival postmarks. An especially attractive and scarce franking combination. 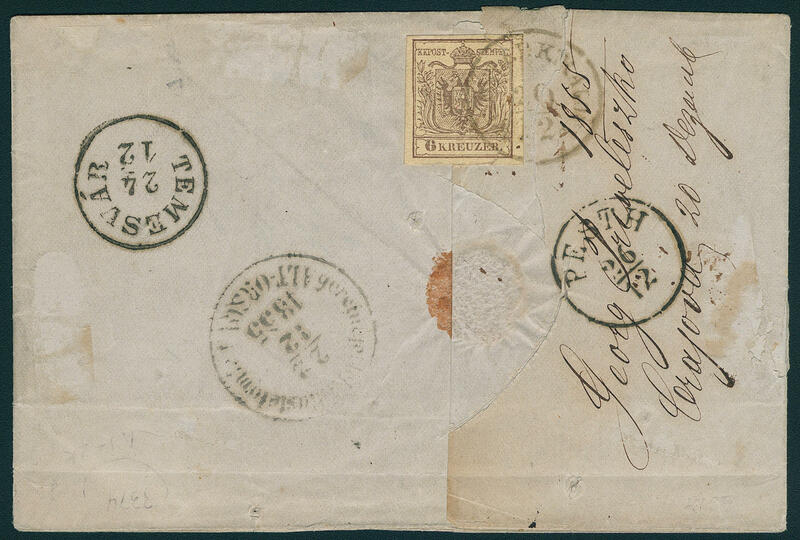 These 26 Kreuzer franking is correctly franked after the Austrian / Italian postal agreement from 1854. The postage step counted of the 3. Austrian in 2. Italian section. A wonderful document from the famous collection from engineer Provera. Photo expertize Prof. Dr. Ferchenbauer. 3981 ✉ 32,U41 3 Kr. 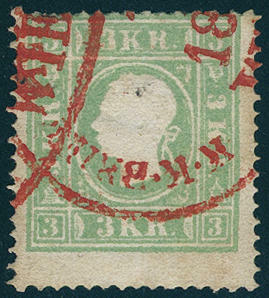 Green, coat of arms, postal stationery cover with on the back additional franking 5 Kr. Rose, wonderful fresh colors and in perfect condition, with two clearly oval cancels \"WIEDEN IN Vienna registered 19.1. \". A very nice and scarce registered mail use! 3982 ✉ 34a,41Ic 15 Kr. 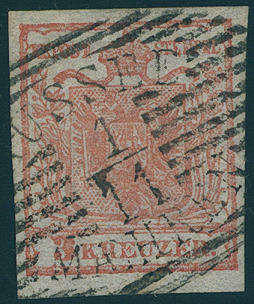 Brown, coat of arms issue 1864, in mixed franking with 50 Kr. Brownish pink, Emperor Francis Joseph 1867 on elongated registered cover, both stamps perfect perforations and fresh colors with a trace of crease, as well 50 Kr. With an inconspicuous tear in margin, with oval cancel \"WIEDEN IN Vienna registered 15.11. \", the cover with various traces of usage, to Prague. An enormously scarce franking-combination, the also in the special catalogue of Mister Dr. Ferchenbauer only with lover price is listed! Photo expertize Dr. Ferchenbauer VÖB. 3983 ✉ 37 5 Kr. 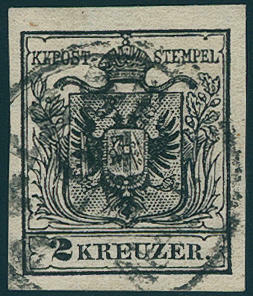 Kaiser Franz Joseph on extremely decorative, printed ornament letter, right shortened, with clear single circle postmark \"OPOTSCHNA B. SAAZ 15.3.83. \" to cost sheet and then to Bilin and Klattau with on the back transit stamp. The cover is front- and reverse colored printed. 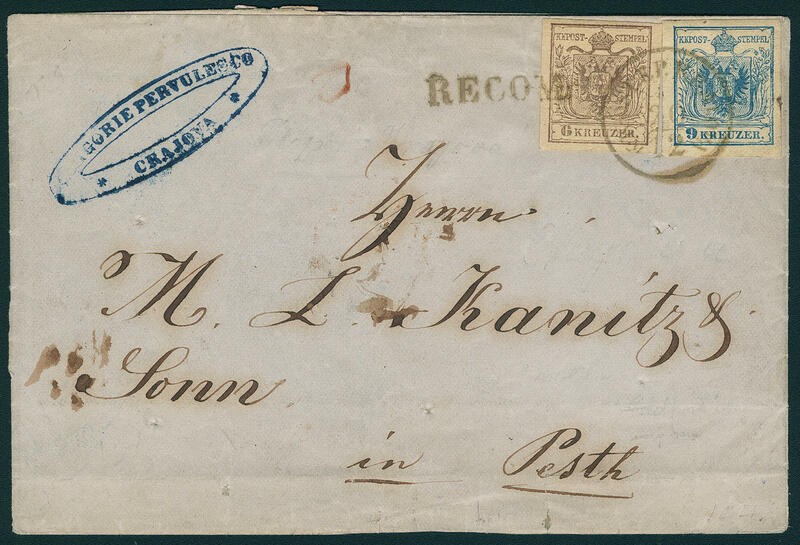 So nice ornamental letters of this issue are extremely rare!